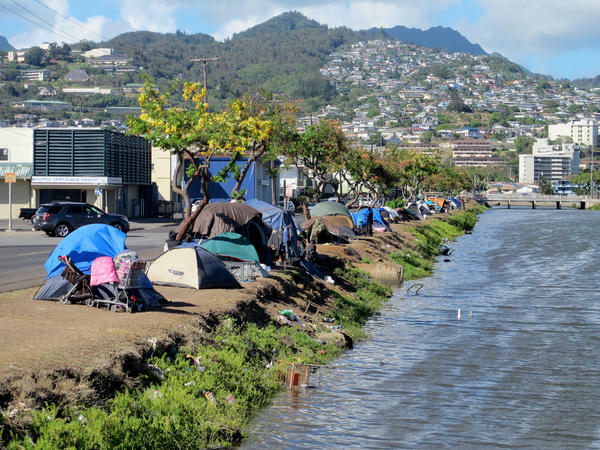 Homeless people and their tents line a canal in Honolulu in June 2015. Hours after a city crew cleared the banks of the canal, the homeless people that had been living there moved right back to the riverside. 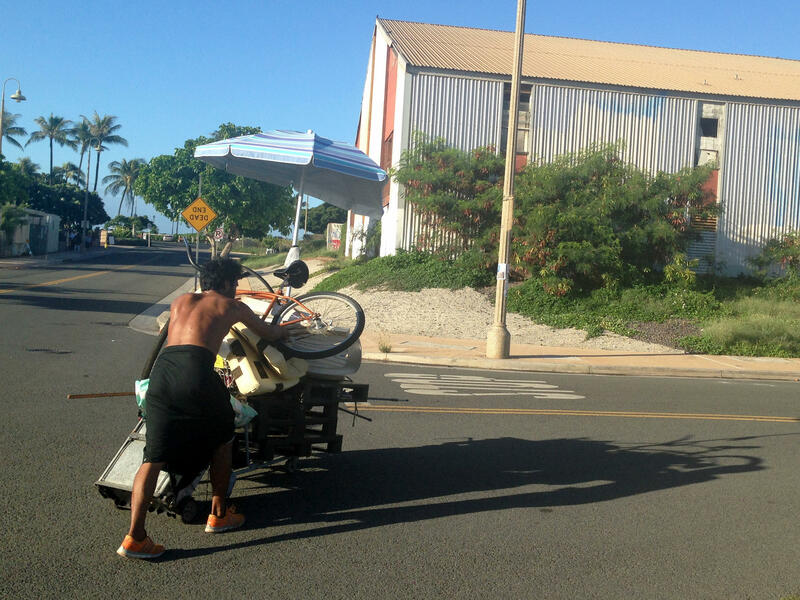 A homeless man who had been living in a large encampment in the Kakaako neighborhood of Honolulu pushes his belongings away as city officials sweep the area on Oct. 8. Honolulu city crews cleared the final section of one of the largest homeless encampments in the nation, once home to hundreds of people. 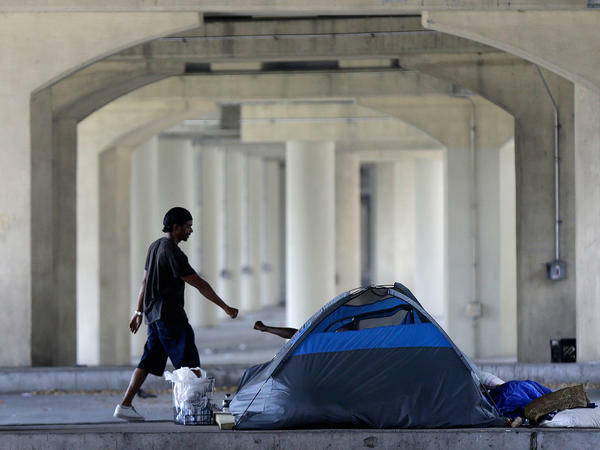 Homeless people greet one another under the Pontchartrain Expressway overpass in New Orleans on Aug. 13, 2014. The city health department put up notices that month giving the estimated 150 homeless people 72 hours to leave the area. Work crews in Honolulu recently dismantled wooden shacks and tents that lined city streets and housed almost 300 people. It was the latest example of a city trying to deal with a growing homeless population, and responding to complaints that these encampments are unsafe, unsanitary and, at the very least, unsightly. Last month, Madison, Wis., banned people from sleeping outside city hall. And in New Port Richey, Fla., the city council voted to restrict the feeding of homeless individuals in a popular park. "We received complaints from the regular users of the park who felt that it was intimidating or they were leaving behind a mess, which was true," says City Manager Debbie Manns. "We had to clean that up." Other cities have passed similar laws with increasing frequency in recent years — restricting outdoor sleeping, begging and other activities linked to homelessness — according to the National Law Center on Homelessness and Poverty. Homeless advocates say these laws criminalize the basic, everyday activities of those who have nowhere else to live. "However, there have been some positive developments just in the last couple of months," says Maria Foscarinis, the law center's executive director, "and some of those are starting to have an impact." In August, the Justice Department filed a brief in her group's case challenging an anti-camping ordinance in Boise, Idaho. The department said such laws are unconstitutional if individuals have nowhere else to stay. A few weeks later, the U.S. Department of Housing and Urban Development announced that it will consider what steps a community is taking to prevent the criminalization of homelessness when it awards $1.9 billion in new homeless assistance grants later this year. "We can't really fight these battles city by city. It's like putting out fires," says Foscarinis. "Now with the federal government taking a stance, I think we really have a chance of turning the ship around." And there are signs that's beginning to happen. Several California communities have stopped enforcing their anti-camping laws to consider alternatives. And in Colorado last month, Denver, Colorado Springs and Boulder suspended panhandling ordinances after a federal judge ruled that one such law was unconstitutional because it violated free speech. Sarah Huntley is a spokesperson for the city of Boulder. "Based on the advice of our city attorney, we made a determination it would be a prudent move to scale back some of the provisions we had, specifically related to how we define aggressive begging," she says. Homeless advocates say they understand why communities are frustrated having people begging, sleeping, and in some cases, defecating in public. But Foscarinis says throwing them in jail doesn't solve the problem. "We agree. People should not be living in public," she says. "What we're saying is the response should not be to make it a crime. The response should be to ensure that people have a place to live." And indeed, many communities are trying to pair enforcement with more positive efforts to get people off the streets. Scott Morishige, homelessness coordinator for the state of Hawaii, says the city and state sent workers out to help those in the street find places to live before the Honolulu camp was torn down. "Really trying to do everything we can to provide an array of supports, so that individuals living in encampments have opportunities to move not only into shelter, if they so choose, but also into permanent housing," he says. Morishige says they succeeded getting about half the camp residents into shelter or housing. They're now turning their attention to the others, many of whom moved to a new encampment that sprung up in a nearby park. Many communities have made it a crime to sleep outside, panhandle or feed large groups of people in public. Homeless advocates say these laws criminalize everyday activities by those who have nowhere else to live, and they're now getting crucial support from the courts and from the Obama administration, as NPR's Pam Fessler reports. PAM FESSLER, BYLINE: In recent weeks, work crews in Honolulu have dismantled wooden shacks and tents that line city streets and housed almost 300 people. It's the latest city trying to deal with a growing homeless population and respond to complaints that such encampments are unsafe, unsanitary, and at the very least, unsightly. Other camps have been cleared in Oregon and Montana, and last month, Madison, Wis., banned people from sleeping outside city hall. In New Port Richey, Fla., the city council just voted to restrict the feeding of homeless individuals in a popular park. Debbie Manns is city manager. DEBBIE MANNS: We received complaints from the regular users of the park, who felt that it was intimidating or, you know, they were leaving behind a mess, which was true and we had to clean that up. FESSLER: And according to the National Law Center on Homelessness and Poverty, cities have been passing such laws with increasing frequency in recent years, restricting outdoor sleeping, begging and other activities linked to homelessness. MARIA FOSCARINIS: However, there have been some positive developments just in the last couple of months, and some of those are starting to have an impact. FESSLER: Maria Foscarinis runs the center. She notes that in August, the U.S. Department of Justice filed a brief in a case challenging an anti-camping ordinance in Boise, Idaho. The department said that such laws are unconstitutional if individuals have nowhere else to stay. And then a few weeks later, the Department of Housing and Urban Development announced that it will consider what steps a community's taking to prevent the criminalization of homelessness when it awards $1.9 billion in new homeless assistance grants. FOSCARINIS: We can't really fight these battles city by city, and it's like putting out fires. Now with the federal government taking a stance, I think we really have a chance of turning the ship around. FESSLER: And there are signs that's beginning to happen. Several California communities have stopped enforcing their anti-camping laws to consider alternatives. And in Colorado last month, Denver, Colorado Springs and Boulder suspended panhandling ordinances after a federal judge ruled that one such law was unconstitutional because it violated free speech. Sarah Huntley is a spokesperson for the city of Boulder. SARAH HUNTLEY: Based on the advice of our city attorney we made a determination that it would be a prudent move to scale back some of the provisions we had, specifically related to how we define aggressive begging. FESSLER: And the city has since revised its law. Advocates say they can understand why communities are frustrated having people begging, sleeping, and in some cases defecating in public. But Foscarinis says throwing them in jail doesn't solve the problem. FOSCARINIS: We agree. People should not be living in public. What we're saying is the response should not be to make it a crime. The response should be to ensure that people have a place to live. FESSLER: And indeed, many communities are trying to pair enforcement with more positive efforts to get people off the streets. Scott Morishige is homelessness coordinator for the state of Hawaii. He says the city and state sent workers out to help those in the street find places to live before the Honolulu camp was torn down. SCOTT MORISHIGE: And we're really trying to do everything we can to provide an array of supports so that individuals living in encampments have opportunities to move not only into shelter, if they so choose, but also into permanent housing. FESSLER: He says they succeeded with about half the residents. They're now turning their attention to the others. Many of them moved to a new camp that sprung up in a nearby park. Pam Fessler, NPR News. Transcript provided by NPR, Copyright NPR.